Back in 2012 my photography was at a crossroads. I was really using three sorts of camera. I had my full Sony DSLR-A700 system with a bag of lenses, mostly the Sony 16-105mm zoom and a collection of classic Minolta lenses made for film. Indeed I almost had the whole set of mainstream lenses as i bought a few at knockdown prices when Minolta's future was very uncertain around 2004-5. This system was good, but actually very heavy to carry around and for that reason I bought a Lumix FZ38 bridge camera which did pretty much anything – including being a fairly decent video camera. However with a 1/2.3" sensor its ultimate quality was limited, particularly as light levels dropped. It was a good enough holiday camera though. I also carried a Lumix FS7 in my pocket – this was bought in 2009 on the way to China as a snapshot camera that would be a step or two up from a phone. Whilst I had seen the first micro four-thirds cameras introduced, the prices seemed pretty high so I hadn't paid much attention. There was also a new version of my FZ38 out – the FZ200 – much more up to date with a 25-600mm constant f2.8 lens and 1080p video, but also with a price tag over £500 so that wasn't the answer either. Then I looked around and noticed that the price of the micro four-thirds (M43) cameras dropped sharply if you bought the outgoing model, and they were on a pretty swift product cycle. So I ended up paying £220 for a refurbed Lumix G2 with 14-42mm lens! I liked this camera. See a review of the G2 here…. Compared to my Sony A700 it added live view, a touchscreen on a rotating mount, a very good EVF, video at 720p and all in a much smaller, lighter package. And at ISOs below 800 there was no noticable difference in the image quality though it was probably a little noisier, but not much, at 1600 and 3200. It was certainly a huge step up from a bridge camera. I soon added the 45-150mm zoom which is very compact and decently sharp and with the M43 crop factor of 2 gives an image equivalent to a 300mm lens on a film camera. After a year of G2 ownership I bought a G3 body secondhand, though with little use for £159, a bargain! It's a smaller, simpler camera but it has a much better sensor – 16 megapixels and capable of probably two stops more at high ISOs. I've taken fabulous aurora photos at ISO 3200 with this camera and they're as clean as a whistle. In fact if anyone fancies dipping a toe in the M43 water without spending much money a G3 with 14-42 lens can now be had for not much over £100 and will give you an excellent camera for very little money. The older 14-45mm version of the standard zoom that shipped with the G1 is a little bit sharper than the original 14-42 and is a better choice if the price is right. Newer cameras come with a smaller 14-42mm lens identifiable by its 46mm filter ring instead of 52mm. This lens is sharper too, on a par with the 14-45mm. The difference with the older 14-42mm is not that it's soft – it isn't, but it seems to lack the biting microcontrast of its predecessor and successor lenses. There is also a 14-42mm Power Zoom lens available and although I don't have this one I am advised that it has soft corners so unless you're a video fan needing the power zoom feature I'd stick to the other lenses. See a review of the G3 here…. 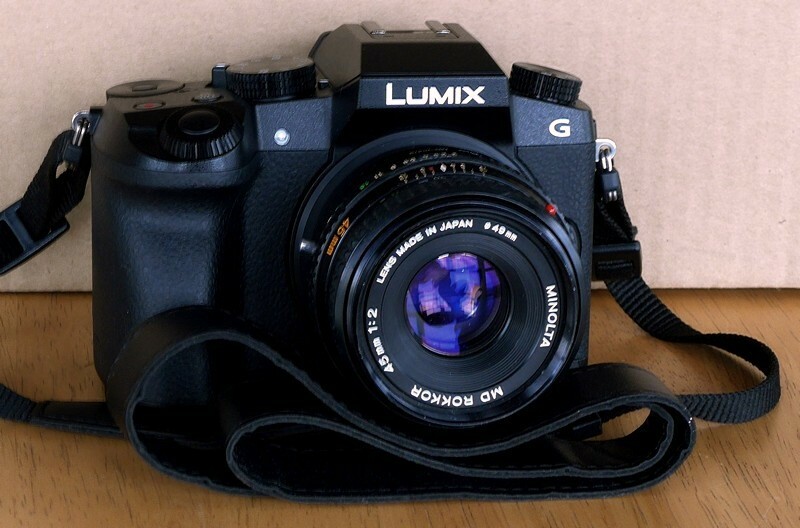 My 2012 Olympics Limied Edition G3 with the later model 14-42mm lens – a winning combination! More recently I've moved up to a G7 which is a fabulous camera that includes pretty much every feature available on a modern camera including a 4K video mode and associated photographic modes enabling the capture of 25 x 8 megapixel still images every second where you need to get that one action shot! See a review of the G7 here…. There is one other feature of the M43 system that makes a huge difference to my photography. I still have a good number of very good lenses from the manual focus era, generally with the Minolta MD mount. These only got used during my increasingly rare adventures with film, the reason being that the MD mount has a flange distance of 43.5mm and when Minolta invented the AF SLR they designed a new mount with a flange distance of 44.5mm, the long and short of which is that it was not possible to make an adaptor that allowed MD lenses to be used on the MAF mount and still focus anywhere near infinity. However without the mirror to account for, the M43 mount comes with a flange distance of only 19.25mm, so it is a straighforward matter to make a converter. And they're available cheaply on eBay, not just for MD mounts, but more or less any 35mm film lens can be fitted to an M43 body! There is a crop factor of course and this is double-edged – old wide angles like the 17mm f3.5 Tokina I have become very ordinary – in this case equivalent to a 34mm field of view. For the most part this range is best covered by standard M43 lenses. The upside is with longer, wide aperture lenses where, for example a 135mm f2.8 becomes equivalent to a 270mm f2.8 which is a really long useful telephoto. Furthermore, it is a feature of Japanese lenses that they tend to be very sharp in the centre with any softness confined to the corners, and the crop means that the sensor is only using that sharp centre. I duly acquired adaptors for MD and MAF mounts. The MAF works, though mechanically not so well as MAF cameras control the aperture from within the camera rather than having a ring on the lens as the MD lenses have, so the adpator has a crude lever allowing you to stop down by an amount that is pure guesswork. The MD mount lenses work superbly though with the camera's excellent metering giving accurate exposures with the camera set to A or P modes. So welcome to the fun world of legacy lenses, where you set your own aperture, focus your own lens and put much more thought into the picture you're taking.